"This is a subtly nuanced recording that always reveals more each time you listen"
"Firstly Tony Whitehead’s Very Quiet Records imprint isn’t some kind of conceptual project. It isn’t ultra minimalist and it isn’t a clever exercise in silence. If this first release is anything to judge by there is a lot of richness and depth contained in these low volume, expansive soundscapes. Of course it does exactly what it says on the tin, because it is indeed very quiet. 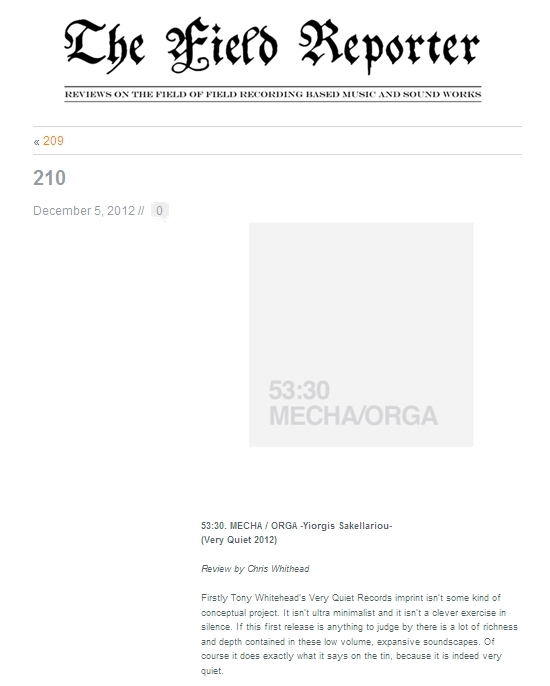 Mecha/Orga is the project and recording name of Greek sound artist Yiorgis Sakellariou, he also curates the label Echomusic. Sakellariou’s tracks are usually named for the length of time it takes to listen to them, which is interesting in itself as sometimes sound artists wish their titles to have no relevance to the composition. This enables the listener to arrive at the work without preconceived ideas, therefore all we know from the title is that this will last 53 minutes and 30 seconds. Although the carefully unobtrusive and elegant design of the cover has no picture, it nevertheless spells out a clarity and an economy of form which is reflected in the content. It is pure white with the artist’s name and the title indicated in a large, pale, perfectly chosen font. A clean, crisp exercise in conveying open space and distance. This is the first in a series of recordings in which a single artist will explore their own quiet places. Each disc will contain one, two or possibly three tracks where duration and subtlety are key features. It seems that the intention of Whitehead is for these to be largely untreated and not composed, rather presented as soundscapes intrinsically grounded in geography and temporality. Kifisia is a northern suburb of Athens, Greece and the recording used as the basis for 53:30 was made outside Sakellariou’s window from midnight until 9am. Whatever editing has been done is seamless and the piece effectively unfolds in real time. At approximately 12:30 and then about fifteen minutes later soft church bells peal out, but we don’t ever hear them again. I don’t want to come over all CSI New York, but I suspect editing here. The work flows on with slow momentum beginning with bird calls from trees and buildings both close and distant. This sets out a kind of space frame from which we can mentally calibrate our place of observation, which obviously never changes throughout. In the background, as in any town, the familiar muffled song of traffic is ever present: A light grey canvas on which the dots and flecks of birdsong add points of colour. Mecha: The machines on far away roads. Orga: The organic music of nature. Listening to works like 53:30 on speakers in the house allows the intrusion of sounds from outside the circle of the recorded sounds. For example, the first time I played the disc, after about 10 minutes it slowly began to rain a little against the window and the wind picked up outside. Because the composition is (obviously) very quiet, there seemed no problem with this transplantation of a whole geography from one location to another, and then setting it against English rain. These supplemental, unplanned additions to the listening experience just reinforce the pleasure derived from a deep appreciation of the holistic, unbounded sea of sound we all exist in. As the birds lose some of their initial enthusiasm, the sounds of human activity creep in across town. Vague bangs and crashes, but distant and happening on the edge of earshot. They eventually become nearer and more frequent. I imagine people are setting out to work as the traffic noticeably picks up. We are aware of an aeroplane’s flight overhead and a vehicle engine ticking over close by. This is a subtly nuanced recording that always reveals more each time you listen, particularly if you listen in different ways. For a pure experience without interruption though, I’d listen late at night when all is quiet, on speakers, with the dishwasher, washing machine and any other distractions turned off. It is like being placed somewhere else and you can’t fight the sense of immersion. Listen with intent to this CD and you will find yourself in Greece as the dawn breaks and Kifisia wakes up."